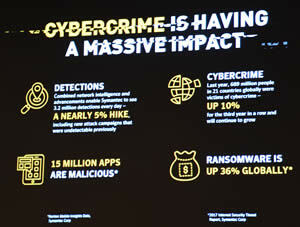 Glen Whichello and Joanna Quintanicho came to discuss the major cyber threats of 2017 and some of the solutions Symantec uses to solve those threats. 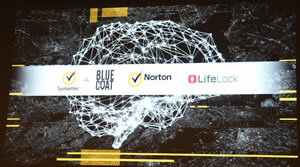 The two major events in 2017 for Symantec are its acquisition of Blue Coat and LifeLock. Here is the press release on the acquisition of Life Lock. Glen then gave us a look at where we are placed in the security worldwide. Ransomware is up 36% and Australia now sits in third place for this type of attack. The statistics indicate that up to a third of Australian victims will pay the ransom. Worst still up to 64% never get their machines unlocked. 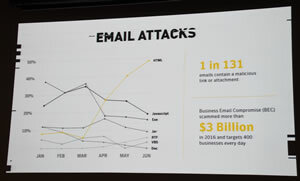 E-mails are still the favourite form of attack. Of real interest was the change of method. The old style executable file attachment now ranks around third place. There is a rise in the use of html formats for presentation and that has seen the rise of code imbedded inside the html. This source of attach rose from 10% to 50% in the last three months of the 2017 financial year. We have heard about the fake bill attack, the traffic fine, or the gas bill. These are called BECs or Business e-mail compromise. What was of interest was the rest of in-house attacks. Would you ignore a request from the CEO to pay an account? 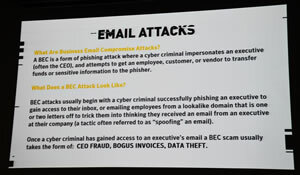 The attack method is for the criminal to get access to the company through a vulnerable account. Once in they send these fake invoices to the accounts department. Naturally, they are not only after money, this access enables theft of stationary, identity theft not to mention sensitive company information. Office allows you to create a small script in visual basic, that automates a process. One example would be a script that puts names from a database in the address area of a letter. Here’s the problem. You get a document file attached to the e-mail, what you get is a script hidden within a document, hidden within an e-mail. Glen explained that when the file is opened the malicious script usually a *.dat file would run and infect the other PCs in the company. 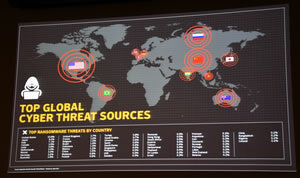 Speaking of the internet of things, Glen mentioned how few of the manufacturers of these “connected” devices give any thought to internet security. 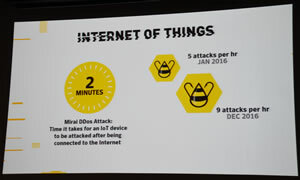 The most common threat is “denial of service” (DoS), an example would be where your smart lights will not turn on when you need them These DoS attacks have risen from 5 per minute in January 2016 to 9 per minute in December. It would appear the smarter a phone gets the more its likely to be attacked. 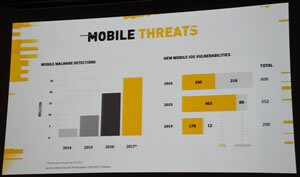 Between 2014 and 2017 the threats to mobile devices rose from five hundred thousand to twenty-five million. Even this user group needs some professional help but we need to be careful - Glen told us that on average a ‘tech support request search’ results in pages of fake sites. Glen even mentioned those “helpful” phone calls from “Microsoft” or “Telstra” informing us we have virus. 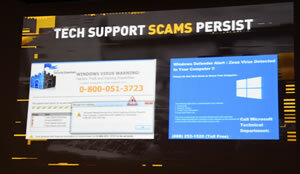 Norton has prevented 150,000 of these scams. Having set the scene for 2017, Glen spoke about the Norton Difference. He started by discussing the resources’ Norton uses to provide this difference, with 3000 researchers across the world including our mates in the Kent St Office in Sydney. 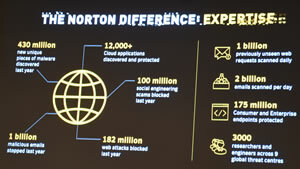 Norton has developed several layers of protections. Glen discussed some of the newer layers starting with the new Ransomware heuristics. Glen discussed how the Norton heuristics helped prevent some Norton customers from the Wannacry infection. This was achieved mainly by using behaviourally based software detection. You may notice that the two main types of files blocked are .exe and .doc files. 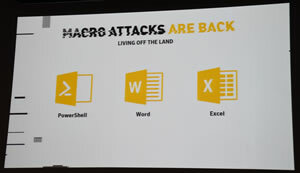 These document files are usually infected with a macro virus. 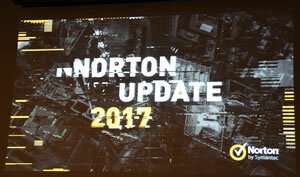 Norton also introduced Backup file versioning to combat attempts by Ransomware to hi-jack your precious backups. This problem gets worst when you realise that virus and ransomware can spread to unprotected USB sticks and even your cloud based backups. 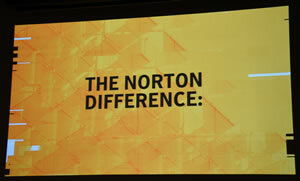 Norton offers 25GB of free protected backup with every subscription. Using Heuristic or learning based comparison software, Norton has been able to block most known and some of the new attempts to infect your machine. Also new is protection for IOS devices like the iPad, along with child lock protections. 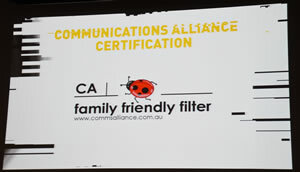 Backed by the Communications Alliance certification. There are other improvements for Mac users. 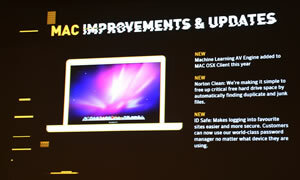 A new learning engine was added and Norton Clean and ID Safe have made it to the Mac. 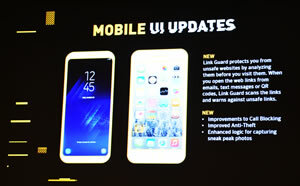 Glen outlined the new improvements to Mobile phone protections with the introduction of Link Guard. It analyses links, e-mails, texts and QR codes to see if there are any problems. Glen then looked at Norton’s VPN Wi-Fi protection. 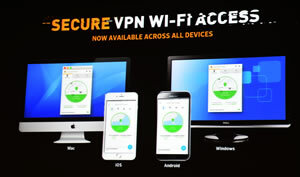 Now extended to all platforms, Wi-Fi Access protects the user over any public Wi-Fi network from theft and intrusion. We watched a video that showed just how vulnerable one can be in those free networks. 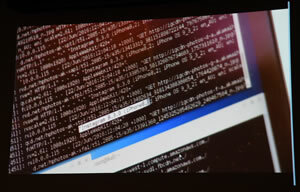 We saw just how a hacker can enter your machine and find all your private data. To finish Glen took us through some of the third-party reviews. 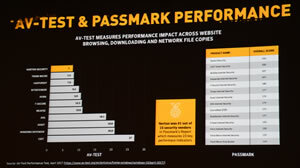 Norton was found to have less system recover time and less performance impact over browsing, downloading and network file coping. 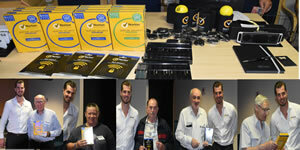 Here are Raffle prizes and some of our winners. Sydney PC User Group Inc. © 2008 Last updated: Wed. 7 Feb. 2018.